We've been working a lot on conversational skills in my pragmatic groups. Although progress has been made, I have one group in particular that still really struggles with sustaining conversation and contingently responding to conversational partners. And when you think about it that is really really difficult! One of the things that is so hard to explain to kids is that although we might start talking about "pets" the conversation can quickly evolve into "favorite foods." Sometimes this happens in a very appropriate way (Kid 1: "My dog loves Fritos!" Kid 2: "Hey, I love Fritos too!" Kid 1: "Yuck, Fritos? No way, Doritos are the best"), and other times it is completely random and inappropriate (kid 1: "My dog's name is Pete." kid 2: "I love Fritos!") Oy!! In order to provide some visual support and increase their understanding of response contingency, I came up with the "Conversation Tree." I thought this activity would really stress their ability to think abstractly, since each part of the tree is a symbol for a part of conversation, but what I found was that the format gave them a more concrete and visual system for mapping out a conversation. They caught on so quickly an really enjoyed the "game!" 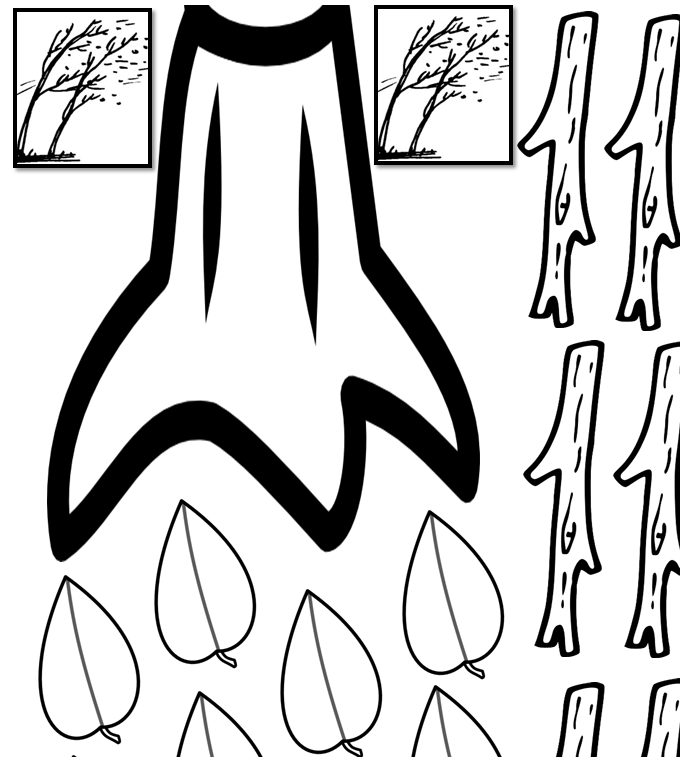 The game pieces represented here below represent the tree trunk, leaves, branches, and wind. The trunk of the tree represents the starting topic of the conversation, the branches are the questions, and the leaves represent the responses to questions or the comments - All those things that we say in the conversation that aren't necessarily the "drivers," but show that we are listening and paying attention. And the wind represents anything that might come up that throws off the conversation - Like lack of eye contact, inappropriate sounds, walking away in the middle of a conversation, etc. The great thing about the trunk metaphor is that it is the topic from which the conversation emanates... The branches and leaves may eventually take the conversation in a different direction, but as long as someone contributes something that is connected to another piece, it usually belongs in the conversation. To play the game, I start by reviewing the pieces with the kids. We talk about how branches and leaves can't just be floating around - They have to attach to something! I give examples of branches and leaves that attach and follow the topic, and ones that don't make sense. The kids thought this was so funny and enjoyed adding some silly examples. Then, we come up with a starting topic together. This was tricky for my kids, so I gave a lot of support here. I wrote the topic on a post-it then stuck it to the trunk so we could all remember. After that, we discussed how we want to grow a big full tree, with lots of branches and leaves. We talked about how silly it would be if a tree only had one branch and tons of leaves, and I gave an example of a conversation that would sound like that (kid 1: "I'm going on vacation!" Kid 2: "cool." kid 3: "awesome." kid 4: "sweet." kid 5: "neat. "), and vice versa. After lots of examples, I dished out the pieces and reminded the kids that you don't need to use all of your branches or leaves, but you do need to use at least one of each. At first, I needed to give a lot of prompting to get everyone started and involved in the conversation, but after a bit of practice, the kids were doing it independently! Once they were comfortable with the basics, I introduced the wind card. We've already discussed a lot of things that can disrupt a conversation, so the kids were able to brainstorm some "tree wreckers" like lack of eye contact, poor body positioning, etc. that might knock over our precious tree. I gave the kids lots of warning before putting the wind card - slowly reaching for it - SLP: "Uh-oh...It feels like it's getting windy! What can we fix? We have to protect our conversation tree! Are we thinking with our eyes? Does anybody need to come back to the table?..." Eventually, I was able to introduce more wind cards for the kids to hold up when they noticed someone else disrupting the conversation. Although I didn't need to do this with my kids, you could have them each color their pieces with different color if you are having problems with one child dominating/not participating. This way, you can reflect on turn-taking by looking at the color distribution in the tree when you're finished. I loved this game so much that I also made a smaller version with an instruction page to practice at home! Grab the full size version, homework size, and instructions page on my Google Docs. This is brilliant. I'm a play therapist who runs a social skills group for 4 high functioning boys with ASD. I am totally going to use this activity this morning. Thank you so much for sharing!